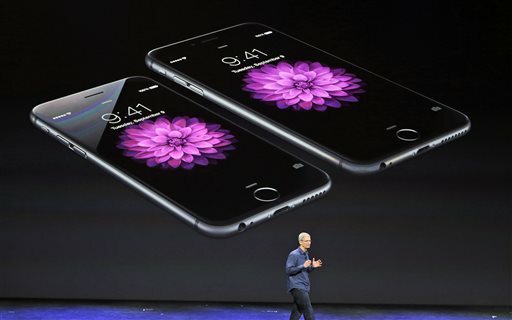 (International Business Times) – Apple’s attempt at the storied “phablet” — the iPhone 6 Plus — could outshine its smaller counterpart in the short term as the device flies off shelves at the company’s stores in the U.S., according to a survey by Piper Jaffray. The survey’s findings follow analysts’ predictions that both new iPhones will convince Android fans to switch to Apple. Gene Munster, an analyst at Piper Jaffray, said in a report that the iPhone 6 Plus is turning out to be “more popular” among buyers than the iPhone 6. The iPhone 6 Plus, which comes with a 5.5-inch display, outsold its smaller counterpart with a 4.7-inch display, in the first weekend that the phones became available. However, Munster expects both iPhone 6 models to attract an equal number of buyers in the coming weekend, with the smaller handset eventually attracting more customers over time, Bloomberg reported, adding that the iPhone 6 Plus is already selling out at some company stores in the U.S. The survey, which was conducted among 386 customers waiting in line in Minneapolis and New York on Sunday to buy the new iPhones, found that 57 percent of respondents intended to buy the iPhone 6 Plus. In addition, more buyers also said that they were willing to pay more for greater storage capacity on either version of the iPhone 6, rather than spending on the iPhone 5s. According to Munster, 22 percent of the respondents chose the 16GB model, 52 percent of them picked the 64GB one while 26 percent opted for the new 128GB versions of the iPhones.